Six Rotarians were over the weekend inducted into the Rotary Club of Fajara, at a colourful ceremony held at the Swiss Boutique Hotel. The six prospect rotarians who were inducted were Mr. Oliver Monk, Christina Persson, Rusell Crier, Ndenneh Senghore, Fatou Fatty and Lena Hydara respectively. 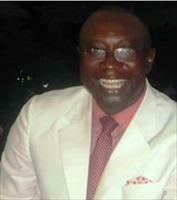 In his inaugural speech, the president of the Rotary Club of Fajara, Sainey Manneh, said a proposal has been reviewed and approved by the board and with their constitution, bye laws, the principal responsibility and obligation of rotary has been fully explained to them and they have expressed their willingness to become rotarians. He said every member was expected to perform his or her share of the club and community services, and the committee of the club would afford them opportunities of services. 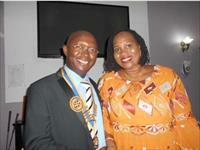 The prospect rotarians were each given a badge as full time rotarians. In her acceptance speech, Christina Persson, expressed delight on behalf of her fellow rotarians, saying that this would be a trial for her on the four questions to become a good rotarian. In his vote of thanks, Rotarian Ozuma, thanked the new rotarians of the Rotary Club of Fajara and urged them to practice the principle of rotary and be always willing to give back to their community as rotary is all about giving back to humanity. The Rotary Club of Fajara over the weekend inaugurated a new president, Sainey Manneh, to take over the mantle of leadership of the said club for 2017/2018, at a ceremony held in Fajara. Delivering his speech, Rotarian president, Sainey Manneh, expressed appreciation on his elevation to the position of president of the Rotary Club of Fajara. He said it marked a time honoured tradition of passing the mantle of leadership of the Rotary Club of Fajara to a new executive for the next one year. “I am deeply humbled by the privilege accorded to me of being the head of the new leadership team of the Rotary Club of Fajara for the next one year,” he said. Mr Manneh paid homage to his Rotarian brethren in The Gambia, both past and the present that have and continue to put service above self in their quest to improve mankind. He thanked the outgoing team for successfully steering the affairs of the club for the past year and successfully moving the club further forward. He said rotary is action oriented, hence being at the helm of such a club requires dedication, commitment and the support of the leadership team and the club members at large. Mr Manneh challenged his fellow members to put all hands on deck so that they could work towards achieving their shared and individual goals for the year. Swiss-Gambia Foundation in collaboration with Rotaray Club of Fajara on Tuesday donated secondhand clothing to three schools in Kanifing: St John’s School for the Deaf, GOVI, and Methodist Special School. The items were presented by the founder of Swiss-Gambia Foundation, Madam Astrid Manneh, who is married to a Gambian Rotarian, Sainey Manneh. Speaking at the presentation at St John’s School for the Deaf, Daniel Mendy, principal of the school, expressed appreciation for the donation to his school. He said the donors’ intervention “is very timely” as the weather is cold these days so the clothes would be useful to the students now than ever. Founder of Swiss-Gambia Foundation, Madam Astrid Manneh, said she is passionate about helping the physically challenged and the blind to carry on with their lives. 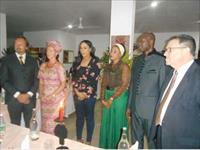 She said the objective of her foundation is to help the most vulnerable children in The Gambia. GOVI headmistress, Natoma Camara, commended the foundation for their “timely intervention”, saying the donation of secondhand clothing is not a small thing to them. She explained that GOVI is a charitable school and most of the services being offered there are on voluntary basis. Yai Fatou B.M. Jobe, Rotaract Club of Fajara, affirmed that Swiss-Gambia Foundation has been helping children in the society for quite a while now. Mamudou Touray, executive director of GOVI, thanked the donors for their “mighty intervention”. Adou Assiz Jallow, commonly known by his artiste name Junior Spices, said the gesture of the foundation will go a long way in helping the children. “I am so proud of Swiss-Gambia Foundation, particularly the founder who came all the way from Switzerland to render support to the Gambian children,” he said. Swiss Gambian Friendship Foundation, based in Switzerland, on 24 December 2015 commenced the construction of two boreholes for the community of Kalagi in West Coast Region. The founder of the foundation, Madam Astrid (Manneh), said she and her Gambian husband (Sainey Manneh) adopted Kalagi and they intent to build two boreholes there. One for the boreholes is for the women, to support them in their horticultural gardens, and the other one is for the community to have access to free clean drinking water. She said they raised the money for the boreholes in Switzerland through donations from friends, philanthropists and other development partners. Mrs Astrid said during the implementation of the project, she and her husband will visit Kalagi to see for themselves the progress and also distribute second hand clothing to the community. She further said in June 2014, she met with the founder of the Home for Kids with Learning Difficulties. The centre is said to have 25 kids who are all staying at the institution; they only go home during weekends.All or most of kids at the centre are said to be abandoned by their fathers. Mrs Astrid said the Swiss/Gambia foundation had supported the centre with second hand clothing.Similar gesture was also extended to SOS Children Village, and Heart House Old Yundum. The founder of the foundation said on 8 January 2016, her foundation, in collaboration with the Rotary Club of Fajara, will make a donation to four different organisations in The Gambia.